This is the song that was sung by community organizers from across the country to kick off the Moving Forward Network’s (MFN) annual meeting in Portland in early February. 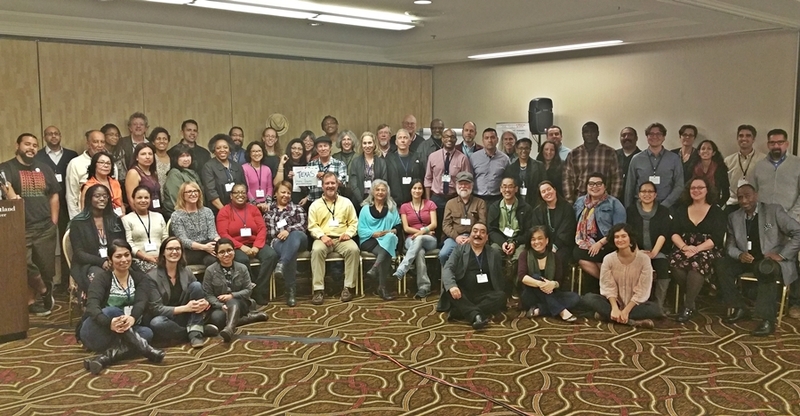 The two-day convening brought together over 50 port activists representing 10+ U.S. inland and coastal ports, as well as large distribution centers. I attended the meeting, alongside Kim Gaddy, Clean Water Action Environmental Justice Organizer, and Jenny Vickers, our Communications Manager, representing the Coalition for Healthy Ports of NY & NJ, a proud member of the MFN. The MFN is a unique partnership of environmental and public health advocacy groups, both local and national, working together on the Zero Campaign, which seeks to reduce dirty diesel emissions through various provisions of the Clean Air Act, as well as direct ports toward zero emissions technologies and goods movement innovations. During the meeting, we participated in multiple workshops and strategy sessions focused on our goal of #ZeroEmissionsNow. One of the most memorable workshops for me was a storytelling session, where we learned why each person is fighting for clean air in their community and what motivated them to get involved. “Having to use my inhaler every day was one of the biggest things that encouraged me to be part of helping others,” said community activist Onyx Bazulto of Brawley, California. “My son’s asthma diagnosis was one of my motivations to get involved,” said community leader Maribel Mireles of Long Beach, California. Everyone’s stories were both heart wrenching and inspiring. In spite of the many hardships and challenges our port communities face every day, no one is giving up. If anything, those stories got us more charged up and determined to forge ahead. Since launching the Zero Campaign, we have helped to generate almost 40,000 signatures on our #ZeroEmissionsNow petition to the EPA and in just an hour over 1,000 tweets to the EPA during our Digital Day of Action. Just days after returning home from Portland, the MFN was invited to the White House to discuss policy recommendations of the Zero Campaign. I joined Angelo Logan, National Policy Director of MFN and Kim Gaddy in Washington DC for this meeting, as well as squeezed in a visit with U.S. Senator Booker (D-NJ) and Menendez’s (D-NJ) staff. They were all very encouraging. The White House staff agreed to nudge the USEPA on our zero emissions agenda. The U.S. Senators agreed to consider a “dear colleague” sign on letter similar to the House version. We’ve got plans to meet up again during Spring Break (March) when they are back in New Jersey. In addition, meetings have been or will be soon held with the key EPA regional administrators across the country. The children’s book The Little Engine that Could told the story of overcoming mountains to move its goods in time for Christmas. The MFN and its member groups are determined to move all of our nation’s ports down the path towards zero emissions. I know we can… I know we can… bring the gift of clean air home. What I’ve learned during this campaign is that our individual local battles and stories are not unique. The ports may be different but the air is still dirty air, truck and rail traffic unbearable, fumes are health harming, and quality of life impaired. And that’s why I am involved and encourage you to get involved too! Please visit our website or contact me to learn more.